We packed-up our car for our road trip; and we treated it similar to a backpacking trip. In six weeks we’ll travel to swamps, beaches, forests, deserts, canyon lands, and cities. Temperatures will fluctuate from the 80s to below freezing, and we’ll be boating, backpacking, hiking, and sightseeing. 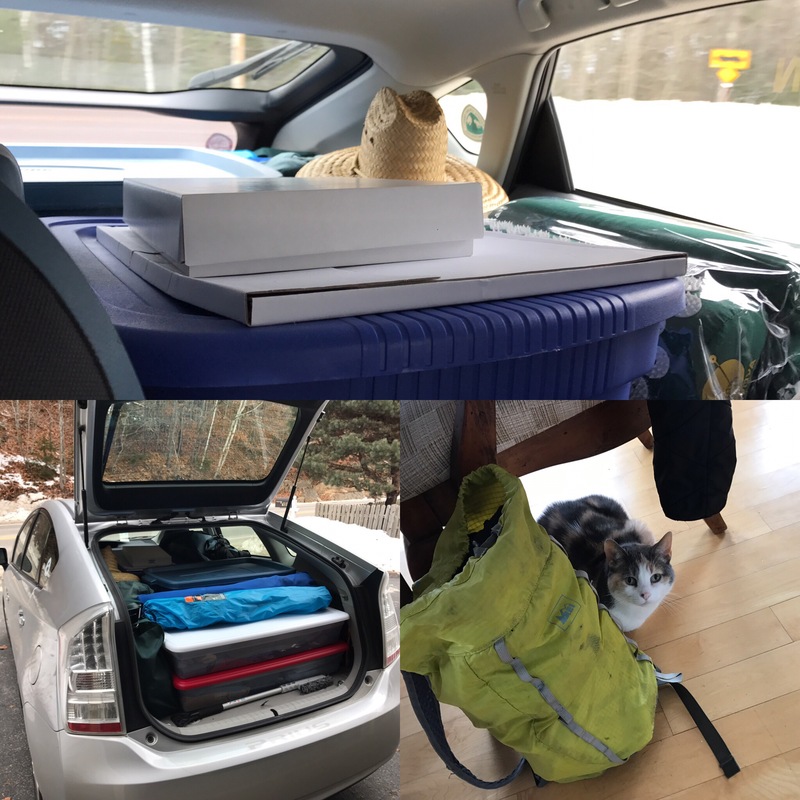 Neither of us have lived out of our car for that long, and we’re trying life out on the road to see if we may want to purchase a vehicle more suited to the task than our 2010 Prius (although, the gas mileage is hard beat!). While we definitely have more room to work with than backpacking and weight isn’t an issue, we also want to minimize how much we need to stop and stay as organized as possible. We used hard totes to keep our things neatly stacked on top of each other. We thought we’d have more room to work with, but eventually fit everything in! 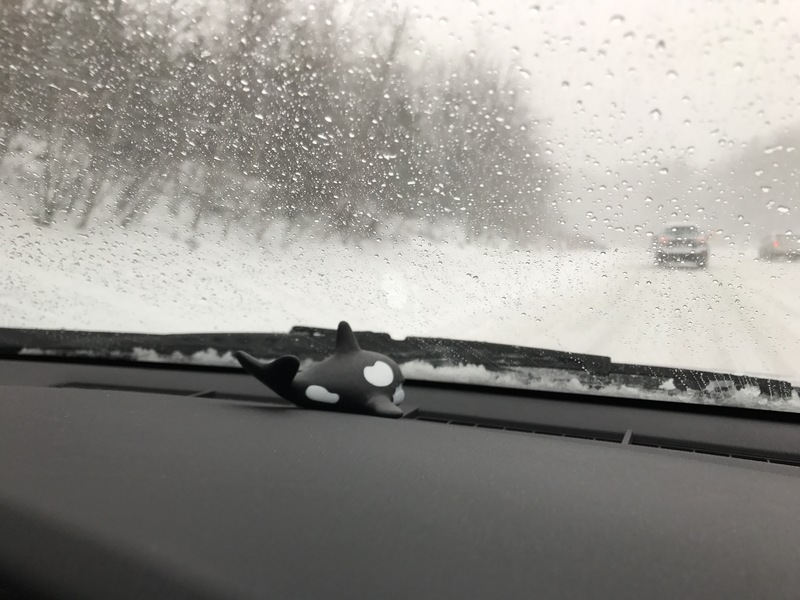 We had a few time constraints on each end of our trip, so despite a blizzard hitting the eastern seaboard, we decided to leave anyway and hope that the south would be clear of snow by the time we hit it the next day. The roads were mostly clear by the time we made it to North Carolina on Sunday, but it was in the 20s and a patch of ice caused a semi-truck to go off the road; adding about an hour onto our anticipated 14 hour drive. 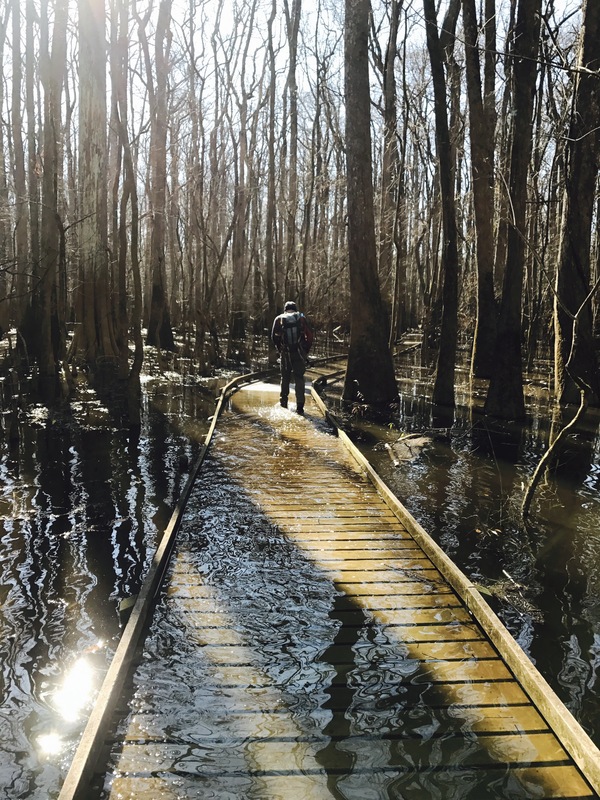 We had hoped to camp at Congaree National Park that night, but with the delay the thought of setting-up camp late at night in freezing temperatures swayed us to stay in a motel. The next morning we went to get breakfast in the lobby, but there was no coffee or juice because the pipes leading to the machines that dispensed the morning beverages had frozen! All of the northerners in the lobby were in disbelief; we ate quickly, and settled for coffee at McDonald’s. We arrived at Congaree shortly after 10am, and embarked on foot to explore the park. 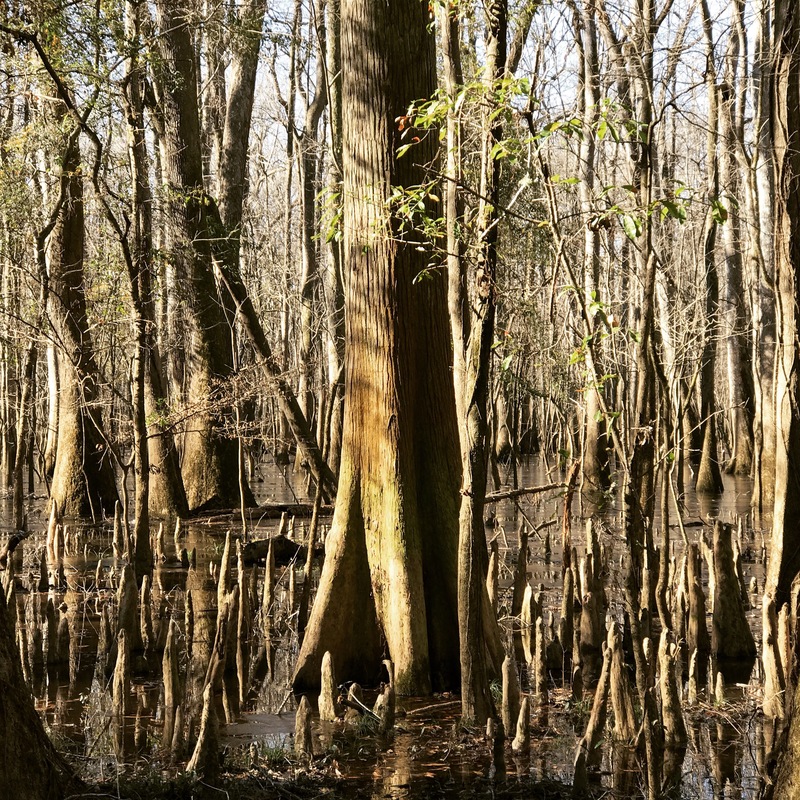 Congaree was made a National Park in 2003, and is the largest area of old growth bottomland hardwood forest in the United States (23,000 acres). It also has an unusually high concentration of “champion trees,” trees that have reached a record height for their species. About a two mile long boardwalk loops around from the visitor center, with various trails leading off to other areas of the park. It was unusually cold the day we were there, hovering in the high-30s most of the day; fortunately the sun was out, and we had a gorgeous start to our hike on the low boardwalk. We were quickly immersed by bald cypruss trees and their knobby roots, referred to as “knees” that protrude from the water. We got about a three quarters of a mile before we had to turn around due to flooding of the boardwalk. We had tromped through sone standing water earlier, but finally reached a point where the water would go over our boots. We headed around to go back to the visitors center and take the high boardwalk which comprised the other half of the loop, to access the trail we were trying to reach. We didn’t mind so much, and we soon found ourself at the trailhead for the River Trail, a 8 mile lollipop trail that took us out to the Congaree River. 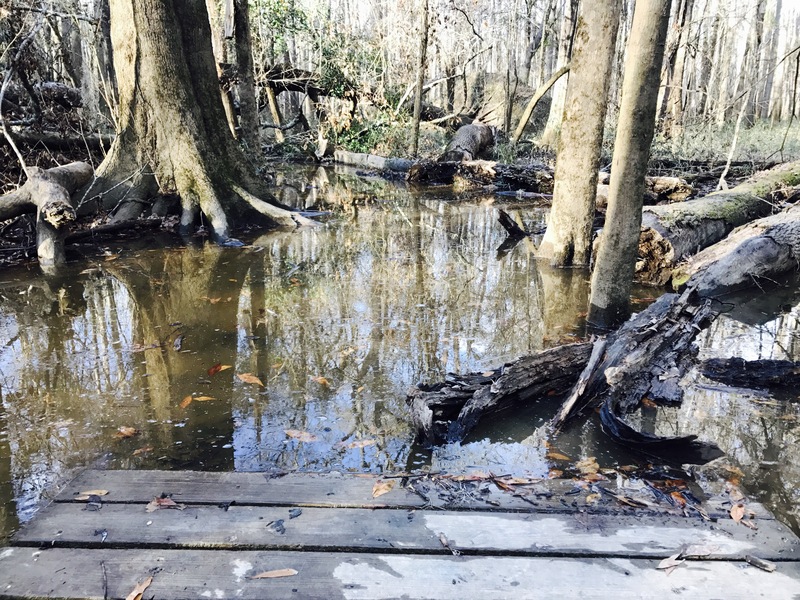 We were a little nervous that if the low boardwalk section was flooded what the forest floor would look like, but the trail took us out of the swamp area and we just encountered a bit of mud. We made it to the river to lunch, and looped back around. We tried another trail back to avoid hiking the same section, and almost got back to the boardwalk but were foiled by more standing water. We retraced our steps and eventually made it back to the visitors center around 5pm, with dry feet and feeling like we had had a day well spent. We set-up camp at the park’s small campground, and unsurprisingly we were the only people there. We made macaroni and cheese on our two burner camping stove we purchased for car camping, and in the process realized we’d forgotten a few food items we had wanted- like hot sauce, extra cheese, and broccoli to make dinner a little more exciting. We still have a thru-hiker mentality to food! We added some dehydrated spinach instead, and it was still tasty because it was macaroni and cheese, after all! Full and satisfied, we crawled into our tent with all of our layers to keep warm in the 20 degree temperatures. When we hiked the PCT we took Garrett’s 2-person backpacking tent which has just enough room for the two of us and our bags with no room to spare. For car camping we use my 3-person backpacking tent. It’s been awhile since we used it, and after spending nearly 5 months in the 2-person tent, the 3-person one felt palatial. 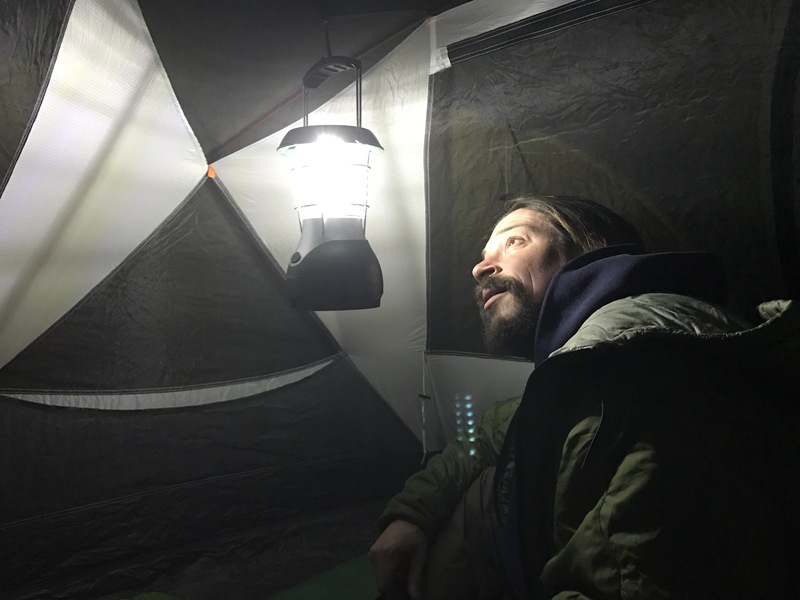 We even had a spot to hang a lantern to play cards too (neither of which we had on the PCT), we could get used to having amenities while camping!